Interns at College Works Painting learn the ins and outs of running a business -- and many of them go on to start their own. The odds are daunting for job-hunting college seniors (and their tuition-paying parents). Hiring has been so slow to recover from the recession that more than a third of recent college grads work in positions that don't require a degree. That's not a problem for alumni of College Works Painting, said Matt Stewart, founder and co-CEO. CWP surveys show that, among the roughly 20,000 veterans of his company's internships, 90% find college-grad-level jobs within three months of graduating, significantly higher than the general population. No wonder, then, that more than 50,000 students apply for CWP internships each year. College Works Painting, headquartered in Irvine, Calif., and operating in 19 states, accepts just 2,000. Of those, Stewart said about half drop out before the summer starts because they decide it's not the right program. 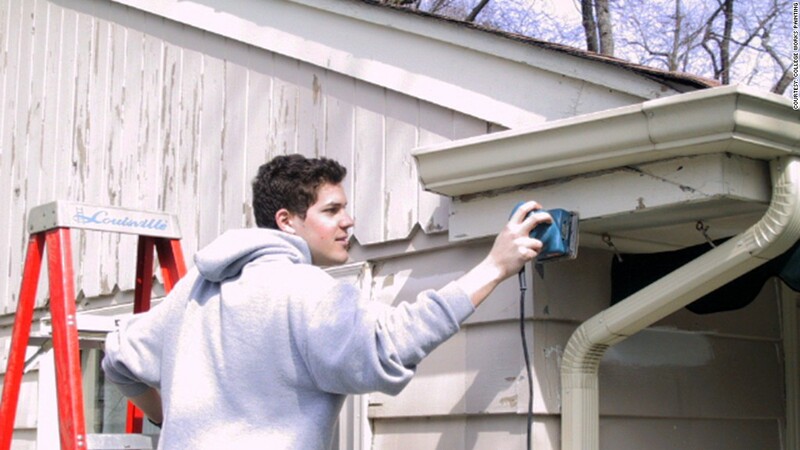 Those who make it through CWP's spring training spend the summer months running their own house painting business: Marketing their services, selling paint jobs, hiring crews, supervising their work, and making sure customers are satisfied. The interns' income depends on how hard they work and how sharp their skills are: Pay, net of expenses, for the 12-week summer season averages $9,300, but can range from a minimum of $4,000 (guaranteed by CWP) to $20,000 or more, depending on how many jobs they book and how efficiently they work. If that sounds like Entrepreneurship 101, it is. "This gives kids a real-world taste of what running a company is like," Stewart noted. "Some of them sign on with no knowledge, or very little, of how business works. We teach them that." The company runs frequent seminars for interns from February until September, "but in the summer is when they're doing the actual work, so they also get in-the-field training from supervisors," Stewart said. "We offer a lot of one-on-one coaching." CWP takes a 40% cut off the top of interns' revenues, which covers things like marketing, training, events (and the company's profits). Although Stewart declined to reveal his firm's revenues or earnings, CWP has grown from four fulltime employees when it started in 1993 to over 200 now. It's also branched out into the real estate and construction businesses, sprouting two new Southern California-based firms. Both were launched by former interns, who share ownership with CWP. Mike Profant, who started Empire Works Construction in 2003, is one of them. "I always wanted to run my own business, but I was undecided between being a sole proprietor and having employees," he said. His CWP internships in the late '90s "showed me that I enjoy managing people and hiring employees." He now has 650. Other former interns say running a CWP painting business taught them that "managing people, especially motivating employees, is more complicated than you think it will be," said Lindsay Patterson, who now owns the Coffee Girls Café in Kansas City, Mo. While a student at St. Louis University, Patterson spent the summers of 2004 and 2005 as a CWP supervisor. "The experience taught me what I call the entrepreneur mindset: You never call in sick. You just push through," she said. "All the skills you pick up managing a painting business are really transferable to any company." Evidently so. Patterson invested her savings to buy Coffee Girls Café in 2011 because "it was owned by people with no business experience, but I saw a lot of potential in it." The shop now has 8 employees and, she said, "has been profitable right from the start."